Armenia’s former President Robert Kocharian was arrested late Friday on charges of “overthrowing the constitutional order” during events surrounding an election a decade ago. 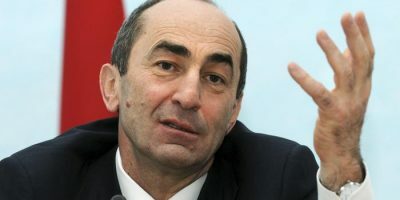 Kocharian, who served as president from 1998 to 2008, will be held in pre-trial detention, a Yerevan court ruled after the Special Investigative Service (SIS) leveled charges against the 63-year-old a day earlier. On Thursday, the ex-president said in a television interview that the charges were “completely falsified” and politically motivated. Investigators accuse Kocharian of rigging the 2008 presidential polls in favor of his ally Serzh Sarkisian. In February and March 2008, supporters of opposition presidential candidate Levon Ter-Petrosian protested after they claimed the vote was fraudulent. Eight protesters and two police officers were killed in the subsequent violence and crackdown. The Constitutional Court validated the election results. Nikol Pashinian, then an opposition activist in the Ter-Petrosian camp, was imprisoned for seven years in June 2009 for instigating post-election violence. He was released in an amnesty in 2011. Pashinian led anti-corruption protests in April this year against Sarkisian, forcing him to quit from the newly empowered prime minister post. Pashinian was then appointed by parliament as prime minister on May 8. He has since appointed a new figure to lead SIS and launched an anti-corruption campaign against former elites. He also seeks to reform what he claims are broken electoral laws. The anti-corruption drive has led to criminal charges or investigations into figures in Sarkisian’s formerly ruling Republican party, including ex-army generals, customs officers and several other senior officials. Separately on Friday, former Deputy Defense Minister Yuri Khachaturov was also charged with usurping the constitutional order during the post-2008 election events. The ex-general, who serves as the secretary general of the post-Soviet Collective Security Treaty Organization military alliance, was released on bail.